I mentioned in yesterday's post that my Bureau 13: Stalking the Night Fantastic character sheets had undergone a significant evolution over the years since I started playing the game (circa 1990). 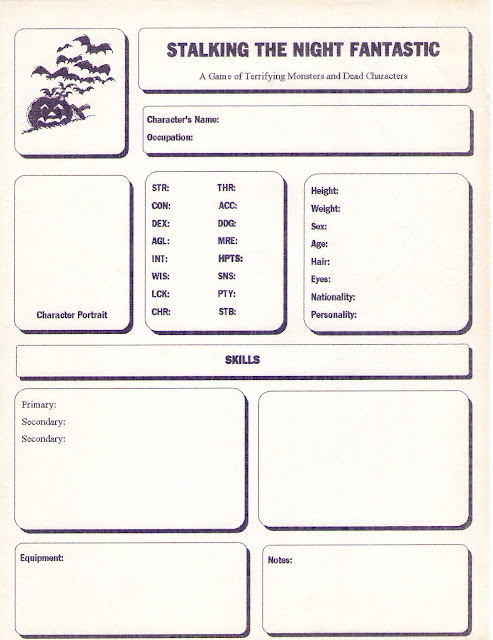 I thought it might be fun to take a look at a few examples of past sheets - I'll let you decide if I was correct or not. 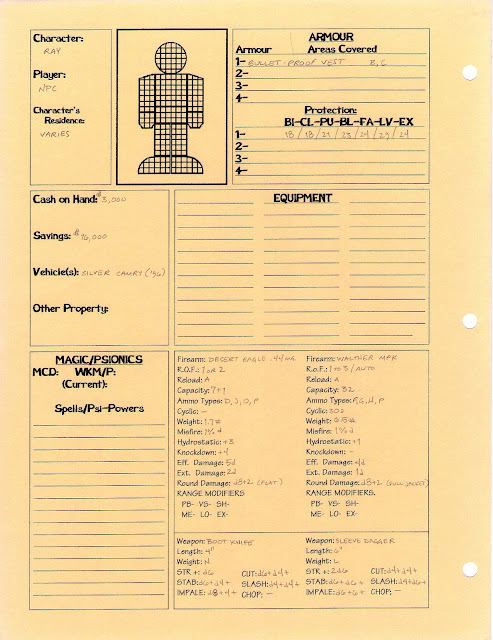 Up first is the handwritten character sheet for Ezekial "Doc" Crane, a character I had played in our Beyond the Supernatural game. I think he was the first character of mine to be converted when we made the switch to B13. 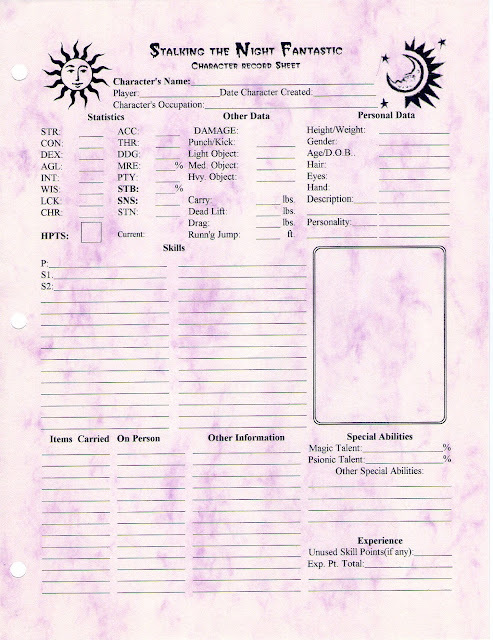 (Shortly thereafter to be supplanted by Fred Carter, whose BtS sheet I've shared already. 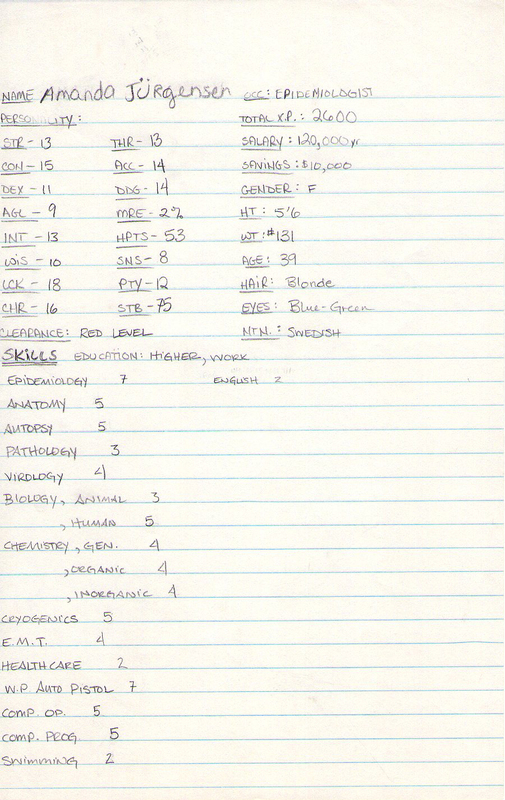 I suppose I should scan and share with you his B13 sheet...) I liked playing Doc and his fear of dead things, but I voluntarily retired him after a game master I was playing with who was a star alumnus of the Monty Haul School of Game Mastery presented us with a wrecked pirate ship loaded with several tons of gold. Doc became a muti-hundred-millionaire overnight, essentially making him no longer a "hungry" monster hunter. It all worked out in the end, though, as Doc used the money to purchase the manor house that had once been the pirate's home and to start a non-profit organization called The Nexus Foundation. As an NPC, Doc went on to provide monetary assistance, support, and a safe haven for monster hunters and their allies. 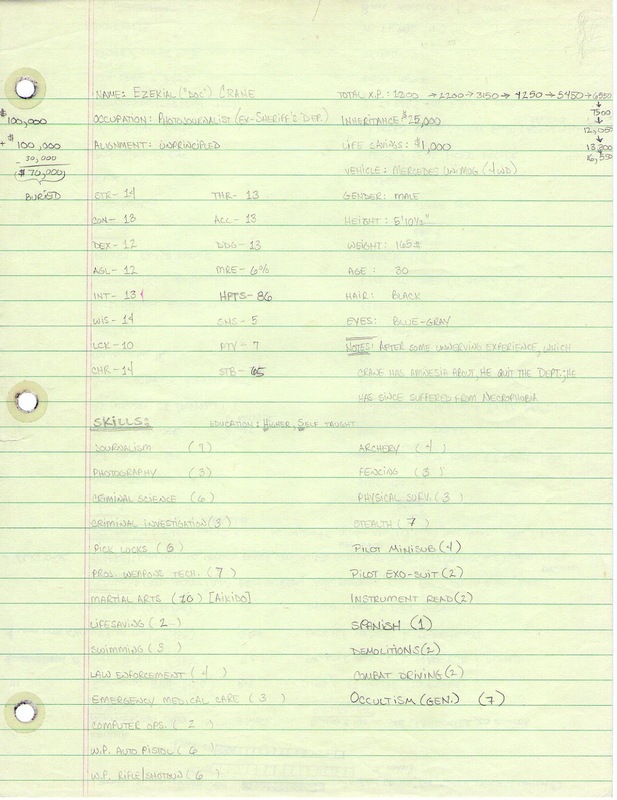 Next is one of the mass-produced handwritten sheets I mentioned in yesterday's post. 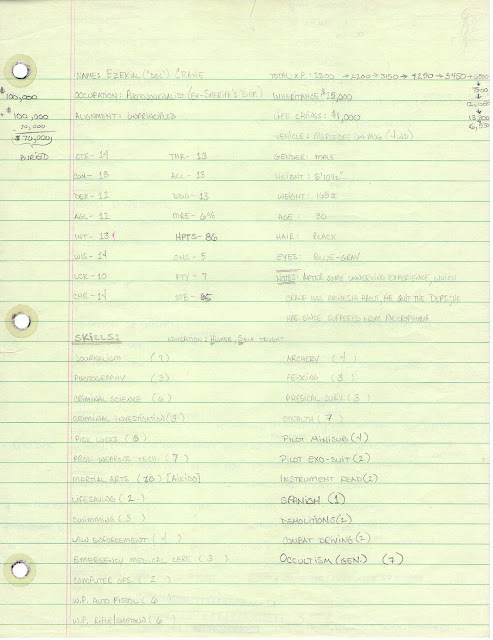 In '91 or '92, I was invited to GM a game for a group that consisted of our current game group, including myself and four players, and a handful of newbies (or as we liked to call them: "FNGs") that consisted of seven or eight friends of those players. 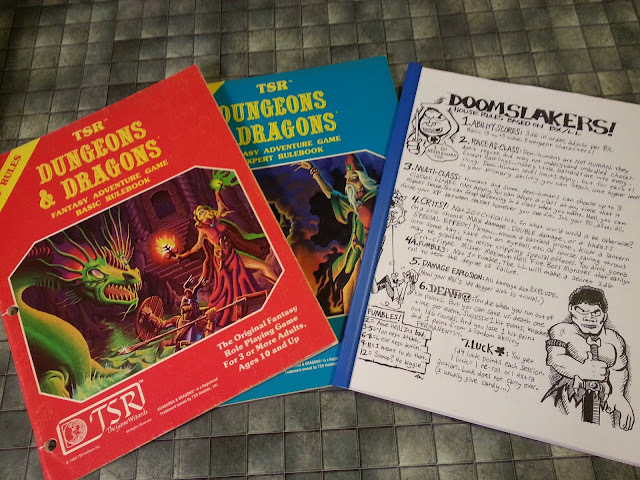 I whipped up a one-shot scenario (that would later be known as "The Beast that Ate Harker's Corners" and would produce a couple of truly memorable and horrifying scenes) and cranked out a dozen or so blank handwritten sheets just before the game. The premise was that the government had assembled a team of doctors, scientists, and military types to investigate a community that had turned into a ghost town literally overnight. 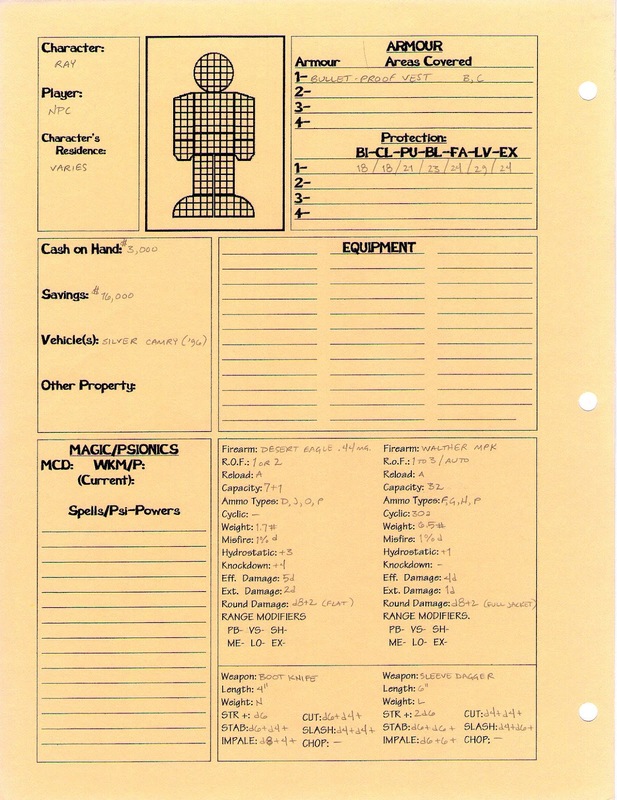 And here we have it: the first computer-designed, printed character sheet I ever made for B13. I had previously made a few sheets ("designed" in Basic) for Dungeons & Dragons and printed them on my dot-matrix printer. But In '93, I was given a copy of AmiPro and I purchased an inkjet printer, improving the quality of sheet I was able to produce. It was all downhill from there! This next sheet design, however, saw a fair amount of use. 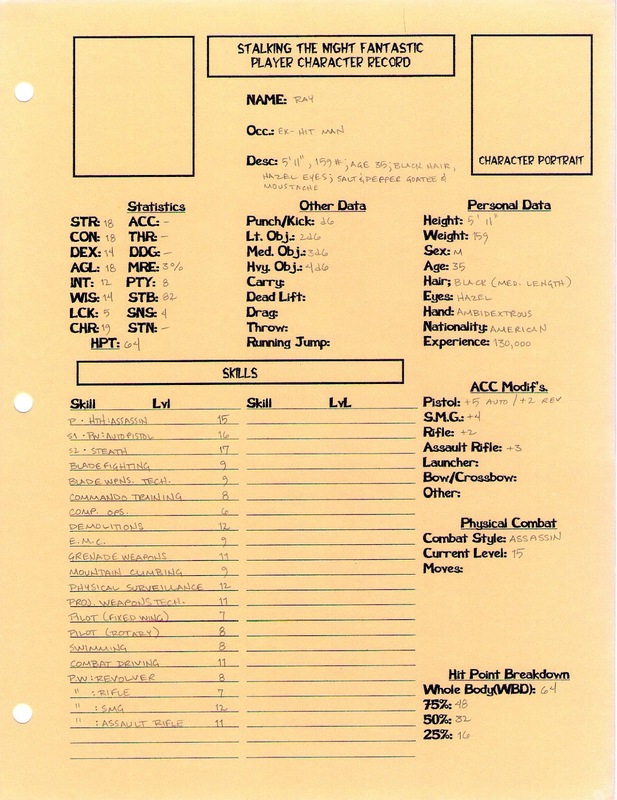 In the summer of '93, somebody gifted me a ream of goldenrod/orange copier paper, and I started printing character sheets (mostly for B13 and Villains & Vigilantes) like a madman! This sheet is for the NPC known only as "Ray." Ray was one of several travelers (including the PCs) who became trapped in a small town when an unnatural fog rolled in. They were forced to take refuge in a motel lobby, and it wasn't long before the whole thing turned into a remake of Frank Belknap Long's "The Space Eaters." Originally believing Ray to be a competent ally, the PCs were shocked when it turned out that he was a professional killer, hired by one of their long-time nemeses to eliminate them. So, there you have it: the origin of the species of my game group's B13 character sheets. I hope you've enjoyed this little jaunt down memory lane. Stay tuned for more B13 memories and artifacts!